The Lifeguard was among the first regiments raised for the Royal Cause, with recruiting begun in June 1642, while the King was at York. By June 27 there were reported to be 1,000 foot, probably including some of the Yeoman of the Guard amongst the regiment, being intended as a “guard for his Majesty’s person.” 2 It should be noted, however, that the role of the Lifeguard of Foot was seen differently from that of the Lifeguard of Horse. Whereas the primary duty of the latter was the protection of the King’s person, the foot regiment was employed as a normal field unit. The regiment’s officers’ commissions were probably commissioned and signed while the King was still in Yorkshire in July 1642, and recruited in the weeks leading up to the Edgehill campaign. 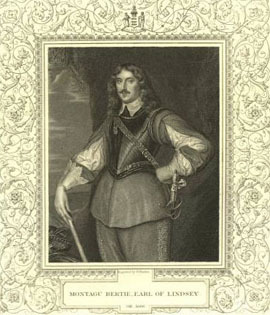 The commander of the regiment throughout the war was Montague Bertie, Lord Willoughby d’Eresby (1608?-1666), who became Earl of Lindsey in 1642, as well as Lord Chamberlain of England. The senior officers were all men of at least some experience (even Lord Willoughby had been a captain in Dutch service). The lieutenant colonel, Sir William Vavasour (killed 1659), had been a colonel of a foot regiment in the Scots War (Second Bishop’s War) of 1640, while Major William Leighton had served as a lieutenant in Foreign Service before 1639. Some of the junior officers (such as Captains Thomas Leigh and Thomas Mynne) had seen service on the Continent or in the Scots Wars, while others had fought in Ireland, with having acquired Irish wives. Of course, as was natural for regiments raised during the Civil Wars (on both sides), many officers were simply country gentlemen having no previous military experience. Even some of the rank and file had prior experience, having also served in either Europe or Ireland, and no doubt some having Irish wives as well. While the Lifeguard seems to have had the most experienced cadre of officers of any regiment in the King’s Army (not to mention Parliament’s), veterans of any rank were hard to come by for either cause in the England of 1642. Byron’s tertia was hotly engaged at this time. Fighting in their midst was Sir Edmund Verney, Knight Marshal and the King’s Standard Bearer, who carried the Banner Royal. According to Sir Edward Sydenham, he “…killed two with his own hands; whereof one of them had killed poor Jason [his servant] and broke the point of his standard at push of pike before he fell…” 9 His hand that held the Banner Royal was cut off, which being found after the battle, was only identified by his signet ring. It is unclear whether the Lifeguard was actually routed, but they were certainly sufficiently disordered to be unfit for further action that day. Ludlow reported that he saw “about threescore lie within the compass of threescore yards upon the ground whereon that brigade fought in which the King’s standard was…” 11 However, these casualties were probably equally divided between the Lifeguard and the Lord General’s Regiment. The Royal Banner was gallantly rescued by Captain John Smith, of Lord Grandison’s Horse. The Life Guard also lost its colours for a brief moment during the final engagement, but these were recovered by Sir Robert Walsh. Though broken for the day, the Lifeguard was not destroyed. In managing to recover its colours, and more importantly the Banner Royal, the regiment regained its high morale it became noted for, and being so highly regarded that it was one of the main regiments held in reserve, which was a testament of its reliability. Regardless of casualties, the Lifeguard of Foot was still one of the strongest in the King’s Army, with only six of the nineteen other Royalist regiments at slightly higher strength. This is based on the pay warrants of November 16th, 1642, which show that the Lifeguard was to receive £238 16s for a week’s pay, having about 670 men at that time. The regiment then took part in the advance on London, in mid November 1642, but was not heavily engaged at either the storming of Brentford or at the engagement at Turnham Green. “The Earl of Bedford signified to this House, “That the Earl of Lyndsey, being a Prisoner at Warwicke, sent to the Lord General, to desire that he might be brought to London, and remain a Prisoner there, in regard it will be more convenient for him to look to divers Occasions that concern his Estate. The Lord General thinks (his Lordship being a Person of Honour) that, if he does give his Word to render himself a Prisoner at London here, he is confident he may be trusted. On 9th December, the regiment went into winter quarters, being one of the four regiments chosen by the Royalist Council of War to garrison the Royalist capital, Oxford.